Conical functions appear in a large number of applications in physics and engineering. 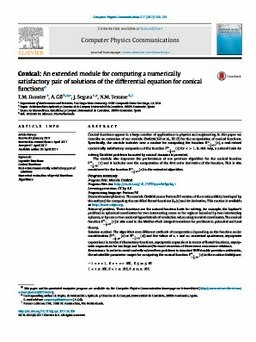 In this paper we describe an extension of our module Conical (Gil et al., 2012) for the computation of conical functions. Specifically, the module includes now a routine for computing the function Rm − 1 2 +iτ (x), a real-valued numerically satisfactory companion of the function Pm − 1 2 +iτ (x) for x > 1. In this way, a natural basis for solving Dirichlet problems bounded by conical domains is provided. The module also improves the performance of our previous algorithm for the conical function Pm − 1 2 +iτ (x) and it includes now the computation of the first order derivative of the function. This is also considered for the function Rm − 1 2 +iτ (x) in the extended algorithm. Program summary Program Title: Module Conical Program Files doi: http://dx.doi.org/10.17632/rpw5d8gdkg.1 Licensing provisions: CC by 4.0 Programming language: Fortran 90 External routines/libraries: The module Conical uses a Fortran 90 version of the routine dkia (developed by the authors) for computing the modified Bessel functions Kia(x) and its derivative. This routine is available at http://toms.calgo.org. Nature of problem: These functions are the natural function basis for solving, for example, the Laplace’s problem in spherical coordinates for two intersecting cones or for regions bounded by two intersecting spheres, or by one or two confocal hyperboloids of revolution when using toroidal coordinates. The conical function Pm − 1 2 +iτ (x) is also used in the Mehler–Fock integral transform for problems in potential and heat theory, Solution method: The algorithm uses different methods of computation depending on the function under consideration (Pm − 1 2 +iτ (x) or Rm − 1 2 +iτ (x)) and the values of x, τ and m: numerical quadrature, asymptotic expansions in terms of elementary functions, asymptotic expansions in terms of Bessel functions, asymptotic expansions for tau large and backward/forward recursion of three-term recurrence relations. Restrictions: In order to avoid underflow/overflow problems in standard IEEE double precision arithmetic, the admissible parameter ranges for computing the conical function Pm − 1 2 +iτ (x) in the routine conicp are: −1 < x < 1, 0 < τ <= 100, 0 ≤ m ≤ 40 1 < x ≤ 100, 0 < τ ≤ 100, 0 ≤ m ≤ 100.